There's several important moments in a man's life - getting married, seeing your first child born and then taking them to their first football match. I was lucky enough to have this privilege recently and it certainly was a fantastic experience. 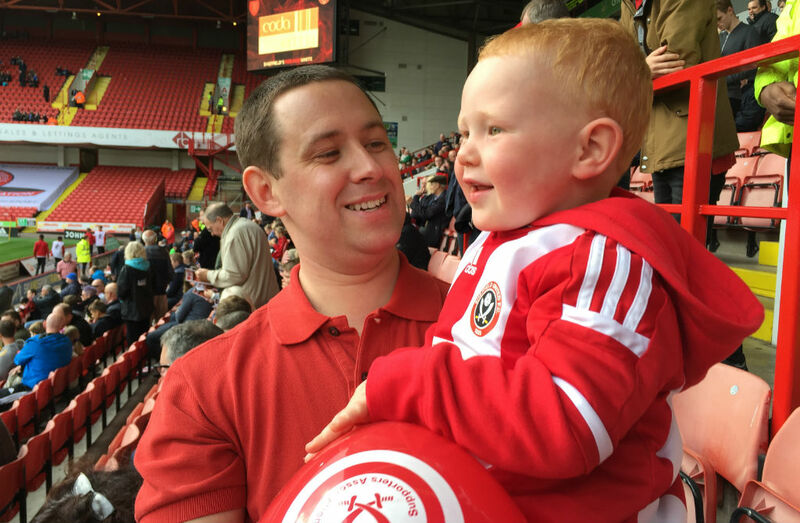 My son, Alex has had a season ticket since he was born (they're only £40/year and Sheffield United's loyalty points system makes it an essential investment for big away games), but with his usual Saturday afternoon babysitter on holiday (his nanan), we decided that 2 years and 8 months was old enough to risk it! My wife sensibly decided that a pre-match Wetherspoons wasn't the best idea (I was only joking) and so after doing some morning house shopping, we headed into town* and had sandwiches in the Peace Gardens. * "town" = Sheffield. Native Sheffielders call Sheffield "town", even though it's a city. I don't know why, we just do. We headed to the ground at around 1.30pm, walking the mile or so from the city centre, under St Mary's roundabout and up onto Bramall Lane. Arriving in plenty of time, we walked up Bramall Lane and to the South Stand, taking pictures as we went. Alex was wearing his Sheffield United shirt and was very happy pointing out the crest which adorns various parts of the ground - "look daddy, it there again". Walking through the South Stand car park, we saw the Rochdale team bus (Alex likes buses, what kid doesn't?) before heading to the corner at the Copthorne Hotel to take our first peak at the pitch. We then walked towards the Kop, stopping in at the Blades Superstore to see if there was anything we could pick up as a momento of his visit. Unfortunately, the Blades' merchandising isn't particularly fantastic and other than a new shirt, there isn't much for toddlers. Whilst in the store we met Captain Blade, United's pirate mascot and tried to get Alex to have his picture taken with him. Unfortunately, Alex was a little scared and point blank refused our attempts to get a photo. Leaving the shop, we walked down Shoreham Street behind the Kop with Alex enjoying walking on the wall. So much so that he wanted to walk on the wall next to the billboard at the corner of John Street - a good 20ft up in the air! It took a while for me to explain that I couldn't reach up there... "why daddy?". Walking down John Street, we bought a programme from the disabled seller just outside (it's the guy my dad usually buys his programmes from) and then headed into the ground. I wanted to get Alex a programme for 2 reasons: 1) as a memento of the day and 2) because I was featured in it, writing about the away team's fans and ground(s). For this season, United have had a couple of injured/uninvolved players at one end of the stand, signing autographs and taking pictures but unfortunately, we were too late for them and so decided to take our seats - about 10 rows up, just the away/Bramall Lane side of the halfway line. On the way to our seats, we saw some friends who are now involved in the Sheffield United Supporters Association and they very kindly gave Alex a red United balloon which definitely helped pass the time until kick-off. Alex clapped as the teams came out, but that was about as interested as he got in all honesty - he sat on our knees for the first few minutes, but then found more fun kicking the seat in front of him... naughty Alex! On the pitch, he would have seen Che Adams score for United before Rochdale levelled from the penalty spot. Good work from Billy Sharp on the wing led to United's second goal with his cross finding Adams again who fired United into a 2-1 lead at half-time. As the whistle went, we took the opportiunity to let Alex run round for a bit, taking him into the John Street stand before re-emerging at the far end next to the away fans. He ran down to the pitch and for just a second I could see him getting arrested for encroaching onto it! Fortunately a nice steward let him run onto the perimiter and he had great fun running to the Kop and back... most of the time followed by daddy running after him shouting "Aelx, stop!". We went back to our usual seats for the start of the 2nd half and decided to be "terrible parents", giving Alex my iPhone so I could actually watch the game! To be fair, he took some good photos!! (See below). After a relatively quiet second half, Dale equalised with 15 minutes to go which looked like it was going to spoil Alex's big day. Luckily Scottish centre half Neill Collins popped-up 2 minutes later to score from a corner to secure a win at Alex's first match. A little boring maybe, but I wanted to make a note of the players who played - that way Alex will be able to say he saw Che Adams score before he played for England (a bold prediction! ).